Miley Cyrus has recently been trying very, very hard to prove that she’s come a long way from Disney’s Hannah Montana. Frankly, she’s seems to be going all out to shock and offend the American people. And now she’s found what is possibly the best way of doing this. She’s obviously converted to Islam. Starting in 2008 and increasingly over the intervening five years we Americans have repeatedly heard how the Republican Party was dying and how the GOP was doomed. Given their showing in the 2008 and 2012 presidential elections and also their inability to retake control of the Senate in the 2010 elections from our domestic enemies, this opinion is easy to arrive at and very seductive to the Left. This, however, is a false assumption. It’s mere hopeful wishing on the part of the Liberals and Progressives and a tool being used by the Establishment GOP to try to maintain control of a party who has left them in favor of returning to America’s roots and core values. It has little or no basis in fact. To start with, the GOP took control of the House of Representatives and has held that control to this date, with little thought that this will change in the 2014 elections. 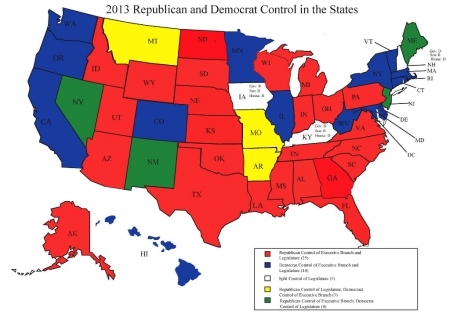 More important and telling is the Republican Party has been emphatically shown to the the States’ party of choice. Does sound or look like the GOP is moribund or does, especially when combined with the GOP’s lasting control of the House, show that the majority of Americans choose and vote Republican? It’s a simple case of the wisdom of subsidiarity. The closer the position is to the People the more often the People chose Republicans because the closer the position is to the People the less they favor the goals and agenda of the Democrats and the less the election is skewed by the bias and prejudices of the minority voters. This is why the Democrats and their operatives focus so heavily upon federal control of- and influence over any and matters, most of which are meant to left to the several States. They know that they’ve built their whole platform on catering the needs and desires of those minority of staunchly Liberal states to the exclusion of needs and desires of the majority of Americans. It’s also why those blue states will remain blue. The Democrats’ policies are tailored to them and do a decent job of fulfilling their wishes. No, the Republican Party isn’t dying. It’s growing from the ground up stronger than before because it’s the States’ party. 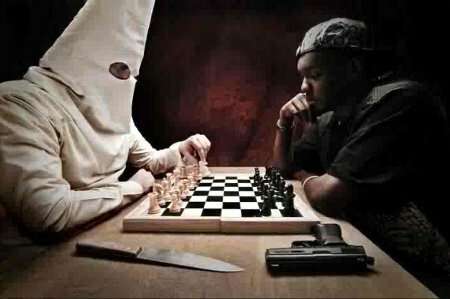 America is inundated by various non-White racial activist groups such as the: NAACP, Black Panthers, National Action Network, Congressional Black Caucus (CBC), Nation of Islam, La Raza, MEChA, and the Congressional Hispanic Caucus (CHC). Yet where are the White activist groups? In actuality America does have White activist groups. Some example of them are the: Ku Klux Klan (KKK), Aryan Nation, National Socialist Movement, and Volksfront. The significant difference between normative, White America and the non-Whites who live within America but who have refused to join their host nation’s People and culture is that we call these groups what they are – racial hate groups, and we treat them and think about them as they deserve. We don’t call what they want any form of justice. Truth be told, it’s been rather amusing to-date to watch and listen to the Warmists scrambling and scrabbling about, trying to re-brand dogma every year or so in an attempt to wrench it into some semblance of a shape that matches reality while still providing an excuse for their attacks upon Western Civilization and the basic liberties of its citizenry. The free peoples of the world will never knowingly adopt Socialism. But under the name of Global Warming they will adopt every fragment of the socialist platform, or so the Warmists hope. The most recent change, however, is not humorous in the least. The problem is that the latest re-branding, “Carbon Pollution” came from Obama’s campaign machine, Organizing for Action. They declared the new name Tuesday, August 13, 2013. 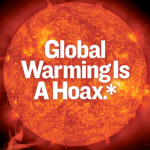 Given the proclivities and pathology of the Thug-in-Chief, there’s little doubt that this re-branding of Global Warming is a precursor to the Obama Regime use of the various regulatory agencies under its control to enact the Warmists’ agenda without the factual color of law or bothering with garnering the legal authority to do so. If CO2 is now Carbon Pollution, then one of the greatest polluters is Obama. He’s spewing out great gusts of it with his constant campaigning and jabbering rantings. This recent change in naming, coming as it does from the Obama Regime’s proxies and foot soldiers, should concern each and every American. With the collapse of the Warmists’ cult’s public acceptance, they’re desperate and desperate people are often willing to go to extreme measures to stave off utter failure and total collapse. This is made worse by their alliance with the Obama Regime, who has never shown much respect for America’s law or its People. There are two common methods employed by criminals and those who pander to criminals to excuse their criminal behavior. These are respectively claiming that no crime was actually committed and blaming others for their criminality. Obama is quite skilled at blending these two excuses into a single narrative. The boy is amazingly competent at this, if at nothing else that humans would consider of worth. I will seize any opportunity I can find to work with Congress to strengthen the middle class, improve their prospects, improve their security, but where Congress is unwilling to act, I will take whatever administrative steps that I can in order to do right by the American people. The Narcissist-in-Chief sound so reasonable and even noble as he shucks and jives his way around the simple fact that a great deal of the time, “I will take whatever administrative steps that I can…” is just a dog-whistle for his usurping authority that he as POTUS doesn’t have. He cannot levy taxes, no matter how he renames them and he cannot fail to enforce and fully execute the laws that Congress enacts. Yet those are the “administrative steps” that the boy consistently resorts to whenever Congress fails to do as he wishes. This is just an attempt on Obama’s part to normalize and legitimize his rampant criminality. Frankly, it’s no surprise that Obama identified with Trayvon Martin; it’s just sad that he never, as of yet, met his Zimmerman.